As of this month, we’ve been travelling together for 20 years! 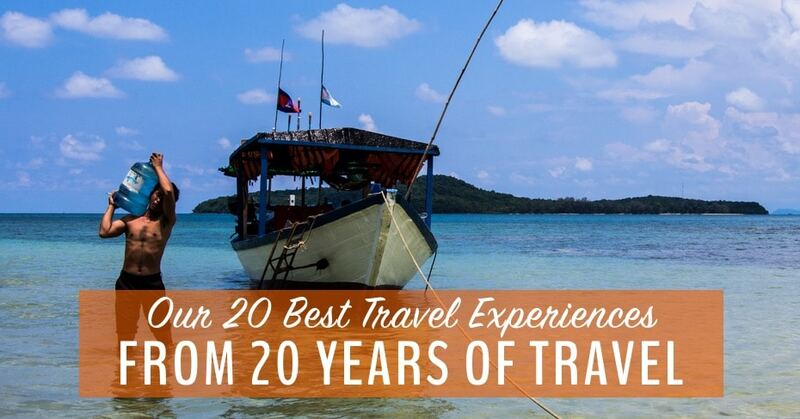 To celebrate, we’re sharing 20 unique travel experiences we’ve had — and they are (almost) all ones you can try yourself. What will you find in our guide to unique travel experiences? People ALWAYS ask us about our favourite country, or the best city for travel, or where to find the best beaches. We decided, after 20 years, that it was high time to put our favourite travel destinations on the blog, so you can start making plans for your adventures. But, when we sat down to brainstorm for this post, we really struggled. It turns out that making a list of favourite travel destinations is hard. After coming up blank for a while, we finally figured out why. We’ve been doing selfies for 20 years! Travel is not about destinations. It’s about experiences. When we think back on our travels, we don’t talk about how amazing such and such a country was, we remember moments. Travel is not a series of glamorous hotels and beautiful beaches, it’s not a collection of pins on a map — travel is a series of memorable moments, all piled up into one long story. Just like life, come to think of it!. If you find yourself in China, don’t miss a trip to Chengdu’s Giant Panda Research Base. To be honest, on the way there, I was a little nervous. Would it be like the zoos back home, where sad-looking animals are trapped in too-small cages? Would the pandas be forced to perform for us, to act like entertainers? We were surprised to find wide open enclosures where pandas could hide behind lush fans of bamboo if they chose. We were encouraged to be as quiet as possible and groups were separated to keep the noise to a minimum. It was a little depressing to learn about the plight of wild pandas. But it was also an absolute thrill to be that close to real live giant panda bears and to learn more about the rescue and breeding program at the centre. It’s still our most amazing animal travel experience. To get closer to Giant Pandas, try the Chengdu Panda Keeper Experience at Dujiangyan Panda Center. You’ll put in some volunteer work, like cleaning out enclosures and you’ll also get to feed and take a photo with these incredible creatures. Find out more about our day at the Giant Panda Research Base and enjoy our 1000 or so photos of pandas. 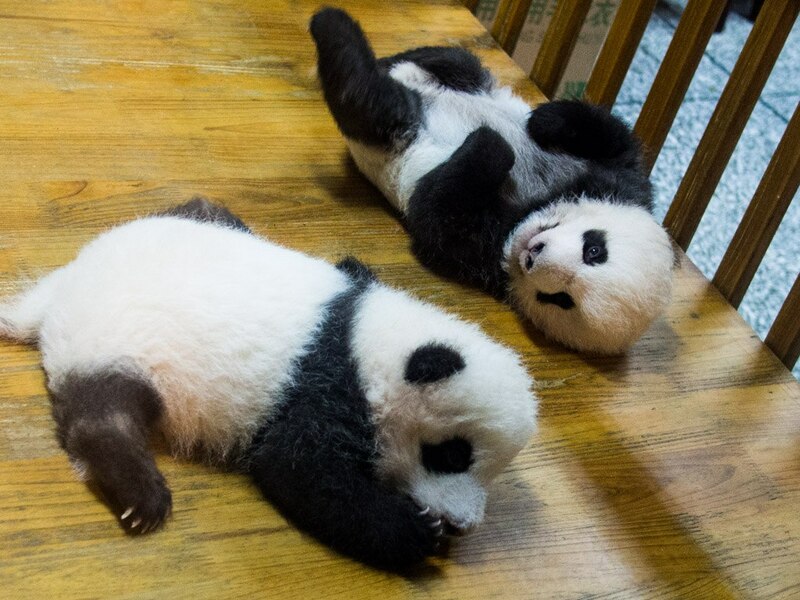 We still remember the adorable baby pandas playing in the nursery! Visit Chengdu if you love panda bears. Travel next to the big Buddha in Leshan, a Yangtze cruise from Chongqing, or hop on a cheap flight to Hong Kong. We climbed many mountains on our two-year cycling trip. The biggest and the most beautiful were the Annamites in northwestern Vietnam. Another glorious view in the Annamite Range. We cycled almost empty roads through tiny mountain villages where people lived in bamboo huts and wore traditional tribal costumes. After hours of ascent, we finally summited the infamous Pha Din pass, where Earth meeets Heaven. The descent was just as heavenly, taking us into valleys bursting with rice fields so green we couldn’t believe our eyes. Find out more about our cycling experiences in the Annamites. We still remember seeing a man emerge fully formed from a bank of earth. Really! Visit the Annamites for a taste of untouristed, rural Vietnam. Don’t bother unless you can go by bicycle or motorbike. Travel next to northern Laos or head north into China. 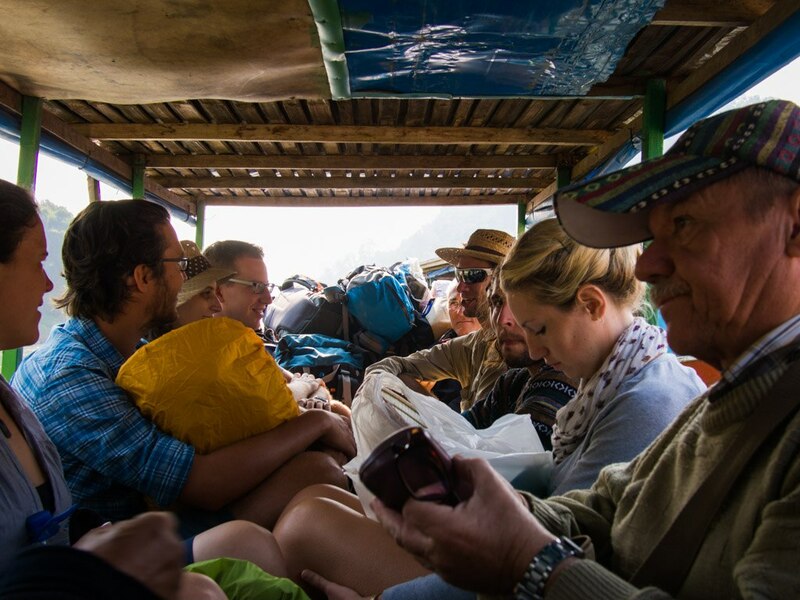 When our overcrowded slow boat from the tiny town of Muang Khua to the tiny town of Nong Khiaw sprung a massive leak and almost sank, the captain had a mutiny on his hands. Though he managed to beach us before much more than our feet got wet, the 20-or-so now-stranded tourists refused to board again. We demanded that he arrange for a second boat to haul half of us. Since that would mean the captain had to split his day’s earnings, he flat-out refused. What happened? Are we still stranded on that beach or did we somehow manage to make it to safety? Find out in Previously, On Laost. We still remember the captain trying to “fix” the boat by adding rocks under the floorboards to raise them! 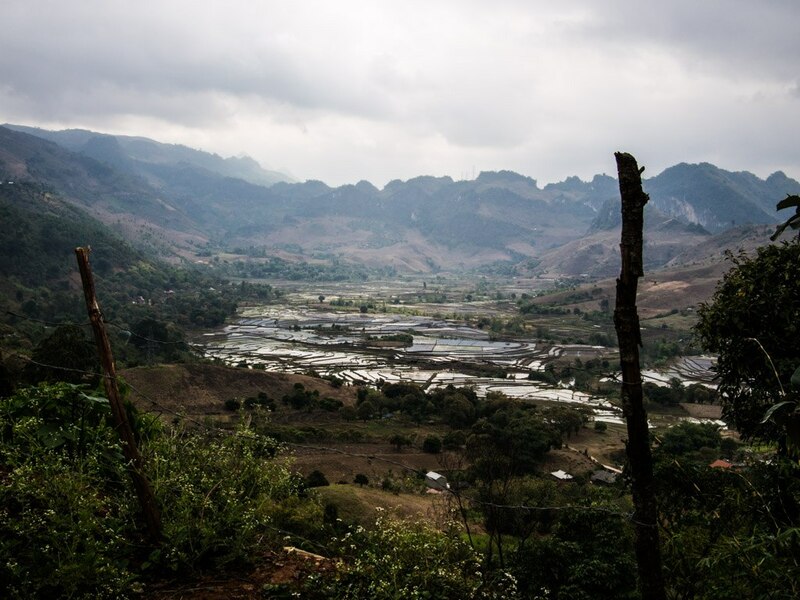 Visit northern Laos for laid-back lazy villages and friendly local culture. 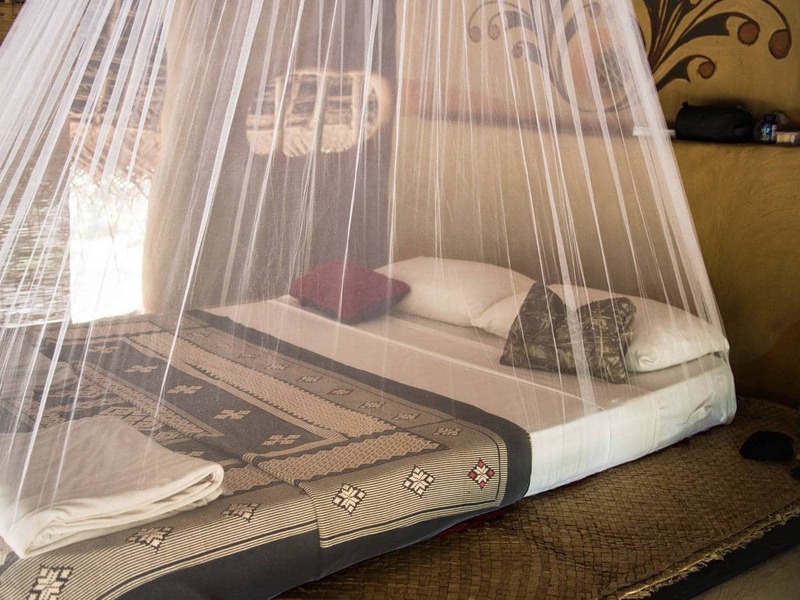 Travel next to Luang Prabang, one of the most romantic cities in the world. As if the island of Koh Ta Kiev in Cambodia — without running water, power, or any building more permanent than a bamboo hut — wasn’t already magical enough… we were thrilled to discover that the sea is phosphorescent! Though it was, admittedly, a little freaky wading into the inky black ocean, once the water started to glow and sparkle at our touch, we were mesmerized. Find out more about our fabulous week on Koh Ta Kiev. And don’t miss our Cambodia itineraries which will help you plan a Cambodia trip suited to your travel style. We still remember feeling like Mickey Mouse in the Sorcerer’s Apprentice as the water sparkled at our touch. 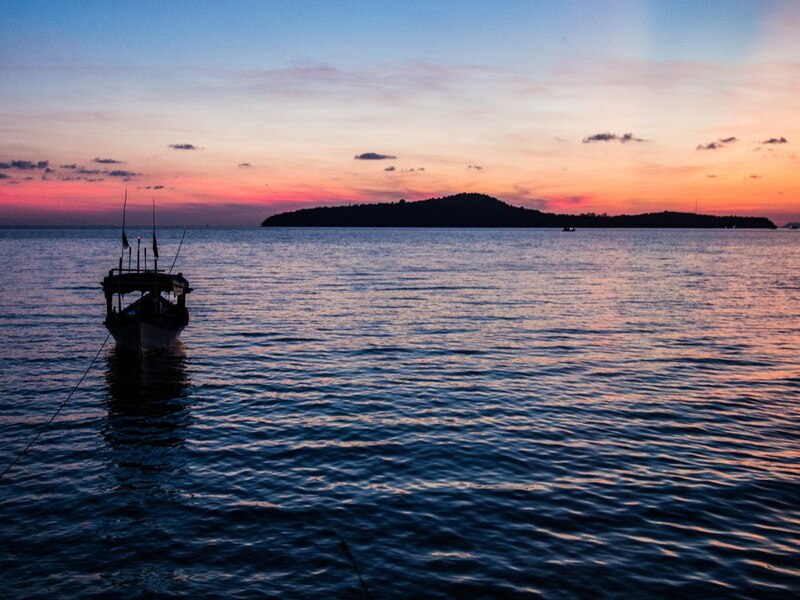 Visit Koh Ta Kiev for your own personal “stranded on a desert island” experience. Travel next to don’t miss the charming river city of Kampot (and its excellent Epic Arts Cafe). Sometimes travel experiences don’t have to be fun to count as our favourites. In fact, discomfort can make a travel experience even more memorable. Such was the experience of travelling Tamil Nadu, India’s southernmost state, by local bus. There’s no better way to become immersed in a local culture than boarding the public bus system. Talk about a crazy travel experience! In India, we were rattled, shaken and almost broken by some of our bus rides. But we also got to discover what normal people eat, do to pass the time, and even where they pee during a long bus ride! Find out more about our crazy bus journeys in Tamil Nadu. We still remember snacking on a delicious bag of roasted peanuts with curry leaves from one of the many food vendors that ply their trade on Tamil Nadu’s busy bus routes. Visit Tamil Nadu for a taste of India without the intensity of the north. Travel next to the backwaters of Kerala or take the short flight to Sri Lanka. We’re not really yoga retreat people, even though we love to do yoga. So we’d never been to a yoga retreat until Stephen was invited to teach at Ulpotha, an idyllic retreat in the jungles of central Sri Lanka. There’s a lot to be said for withdrawing from the world, living outdoors, eating fresh cooked vegetarian meals, and practicing yoga twice a day. We loved it so much, we hope to run our own retreat before another year goes by. Stay tuned. Our perfect hut at Ulpotha Yoga Retreat in Sri Lanka. We still remember waking up to the sound of monkeys jumping on the roof of our one-walled hut. Visit Sri Lanka for all of our 19 top reasons to visit Sri Lanka. Travel next to the Maldives, just a cheap flight from Sri Lanka. 7. Sailing to Our 51st Country! It was thrilling to realize, as we sailed on the ferry from Batam, Indonesia to Singapore that we would be getting off the boat in our 51st country. Arriving in a new country is always a special experience because everything changes in an instant. Suddenly there is new food, new money, a new language and new customs. Singapore is such an iconic city that we couldn’t wait to get our first taste. Unfortunately, we only had a few hours to explore… we’ll have to go back soon. We still remember it like it was just a few weeks ago! Visit Singapore for amazing architecture and the world’s best shopping malls. Travel next on a flight from Singapore to Kuala Lumpur, home of one of our favourite coffee roasters. We were so enraptured by the dramatic history of Pompeii that we spent the entire day wandering its cobbled lanes and decrepit villas. I guess people don’t usually spend that long at Pompeii because nobody had told us what time the site would close. When we finally returned to the entrance, well after dark, we discovered a locked gate, with us on the inside! We were just starting to imagine a cold night cuddled up with packs of wild dogs, when the night guard found us. We still remember climbing into a closed villa to get a closer look at a vibrant fresco. Visit Pompeii for history so palpable you get lost in it. Travel next to the Amalfi Coast, Sicily, or Italy’s wonderful hill towns. Even in the late 1990s, a few thousand dollars didn’t go very far. After four months of backpacking, we had almost burned through our meagre savings. While I went to Geneva to learn French (fail! ), Stephen stayed in Chamonix to become a ski bum (obviously the better choice). After getting fired from his job in a ski shop (he couldn’t handle the technical terms in French), he became a bartender at a café part way up the mountain. He didn’t earn much but it was just enough to get him through one awesome ski season. We still remember Stephen being airlifted off of Mont Blanc after dislocating his shoulder. Visit Chamonix for stylish ski bumming. Travel next to Geneva, Nice, or take a day trip to Torino. It might not technically be the longest in the world but Portugal’s west coast is one endless stretch of perfect sandy beach. We spent several weeks driving and camping from Porto to Sagres. A perfect, blissful budget holiday. We still remember endless trails of giant ants on the sandy forest floor. Visit Portugal for beautiful beaches at a budget price. Travel next to Lisbon to sample all the amazing food. Back when we still occasionally ate fish, we were lucky enough to be invited out on a friend’s boat for a midnight fishing expedition. 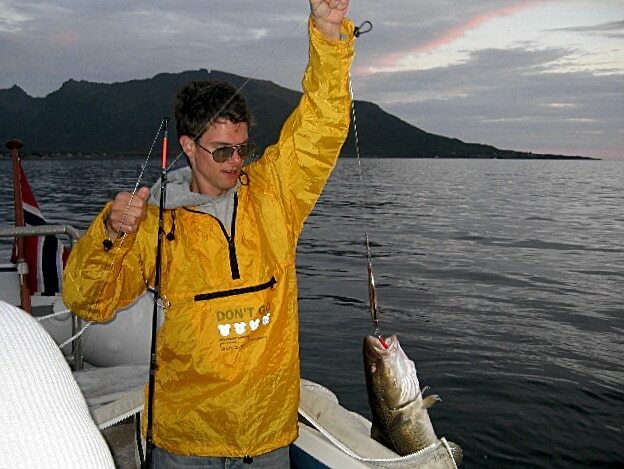 Yup, we were vegetarian and we went fishing under the midnight sun in Norway! It was late June and as the sun dipped down towards the horizon, our sleepy eyelids followed. For a just a moment, the sun hid below the horizon — and then popped right back up again. As the sun came up, shortly after midnight, we felt re-energized as though we’d had a full night’s sleep. Being out on a boat under the midnight sun is very high on our list of best travel experiences. We still remember our friend’s mom covered in blood as she gutted dozens of fresh fish. Visit Northern Norway for 24-hour daylight and perfect, untouched coastline. Travel next to see the northern lights in Tromso or hop on the Hurtigruten from Stockmarknes to Bergen. Did you know that Finland has around 179,000 islands? No? Neither did we until we were cycling through the country and some local friends suggested we cycle the Finnish Archipelago. It became one of the best travel experiences we’ve ever had. View from our tent, early morning, Finland. Finland has the “freedom to roam”, which means you can legally camp anywhere as long as you’re a reasonable distance from any building. With a system of free ferries connecting the main islands of the archipelago, we were able to cycle all the way from Turku to Åland, with food as our only expense. It was a truly idyllic summer travel experience! Find out more about our travel experiences on the Finnish Archipelago. We still remember bathing in lakes while living outdoors for weeks on end. 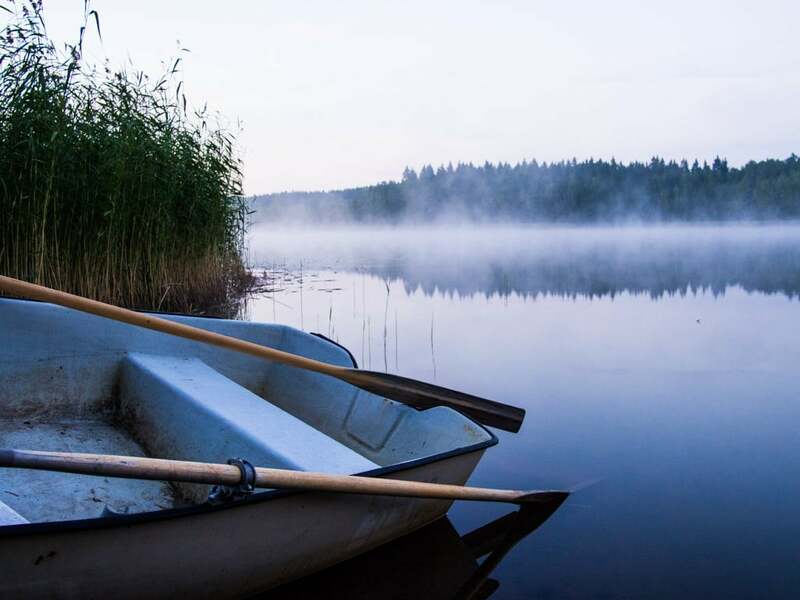 Visit the Finnish Archipelago for pristine islands and perfect lakes. Travel next to Sweden by ferry from the Åland Islands. Transylvania has has many cultural and historical attractions, including some legendary castles, but we fell in love with its beautiful landscape. Just outside Sibiu, we hiked up the snowy crest of Paltinis in early spring. Then we tackled the steep hillside that overlooks Brasov. Finally, we cycled for a day through the villages near Biertan, getting to experience what small town life in Romania. Find out more about our cycling day trip in Transylvania. We still remember eating a picnic lunch in the shelter of a sheep hut at the top of Paltinis. Visit Romania for a slower pace of life and the great outdoors. Travel next to the fabulous cities of Sofia and Plovdiv, in Bulgaria. Between our life in London and our life in LA, we took a few months to travel through North Africa and the Middle East. Despite all the warnings about how dangerous driving in Morocco could be, and despite never having been to Africa before, we decided to rent a car and tour the country. With hay trucks wider than the road, police check points every 50 km, completely chaotic traffic in Casablanca, and losing our passports in Chefchaouen, it became one epic road trip and fuelled our taste for adventure. We still remember arriving at the Sahara only to find pouring rain and a flood so treacherous it had completely wiped out much of the town of Merzouga. Visit Morocco for exotic sights and spices. Travel next to experience the Canary Islands or take a ferry to Spain. There have only been a handful of times when we’ve seen the night sky completely unadulterated by city lights. A couple of those were on our Intrepid Travel tour of the Middle East. Only once have we slept in the open air, gazing up at the heavens so dense with stars that they formed an extra blanket for our sleepy heads. Waking up to the glorious sunrise over Wadi Rum’s pink sands was one of the best travel experiences of our lives. We still remember the chicken and potatoes our guides roasted under the sand that night (nope, we didn’t eat the chicken but we did have potatoes!). Visit Jordan for spectacular sand dunes and the drama of Petra. Travel next to hop on a cheap flight to Dubai or Istanbul, since you can’t travel safely to most of Jordan’s neighbours right now. We’re sorry to say, this is the one travel experience from our list that you won’t be able to replicate any time soon. Before Syria was ravaged by war, we were lucky enough to explore this incredibly welcoming country. George Bush had already declared them the axis of evil, but the people we met were warm, welcoming, funny, and very grateful to us for visiting their country. The ancient city of Palmyra before it was badly damaged by ISIL. The ancient city of Palmyra sparked our imaginations and we were pulled back to an age when an onion was exotic and the Silk Road cities were on the cutting edge of globalization. Find out more about our trip to Syria before the war. We still remember meeting a small boy who could sell postcards in seven languages, even though he rarely went to school. 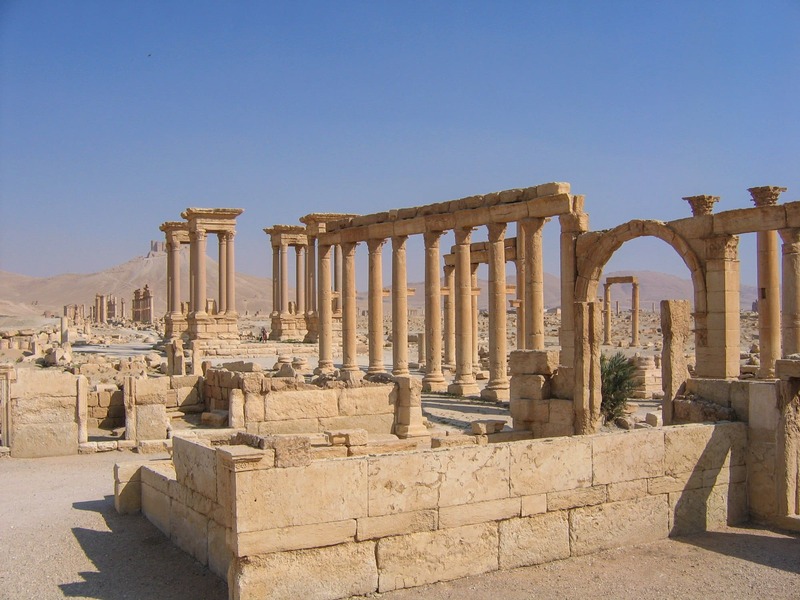 Visit Palmyria for… you can’t visit Palmyra right now but we hope soon you’ll be able to go again. When our relationship was new, like a shiny, bright coin, we took our first overnight trip together to the most romantic campground in the world. 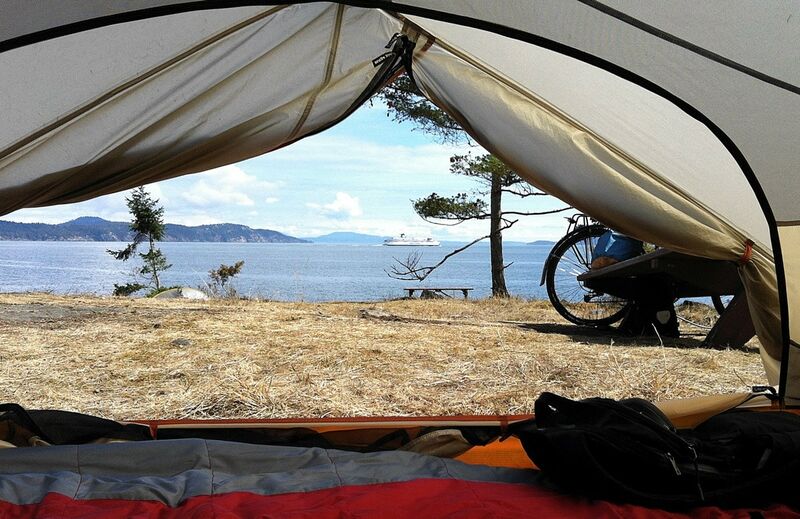 At Ruckle Point Provincial Park, the campsites are perched on the edge of a heavenly channel where you can watch ferries glide back and forth between Vancouver and The Gulf Islands. Walking on the beach is pure paradise. Ruckle Point is the best camping spot on Earth (according to us)! We returned in 2015 and the site is just as perfect as it was 20 years ago. It’s possibly our favourite travel experience of all time! We still remember a German tourist asking if we had a “heavy knife” he could borrow. It took us a few minutes to figure out that he needed an axe. Visit Saltspring Island for getting back to nature in a truly beautiful setting. Travel next to Galiano Island or the Cowichan Valley on awesome Vancouver Island. One of our favourite places on Earth feels like a completely different planet. Joshua Tree National Park never fails to take our breath away and the local people are a fascinating breed, accustomed to surviving in wide open spaces and a brutal climate. One night, after Chris T-T and Frank Turner played a show at Pappy & Harriet’s bar in Pioneertown (you must go there!) we all returned to our hotel and saw a miracle in the sky. A complete white halo encircled the moon… it was our first (and only) moonbow sighting. We still remember an incredible day guerrilla filming this music video in Joshua Tree (watch until the end to see my embarrassing cameo). Visit the High Desert for a trip to another planet. Travel next to LA, San Diego, Palm Springs, or take a road trip on Route 66. This was my first solo trip, just after we had finished our 2-year bike trip. Travelling by car seemed ridiculously fast at the time, so I only drove 50-100 km per day, leaving plenty of time for exploring the natural beauty of the American Pacific Coast. This could be the most beautiful coastline in the world. Unfortunately, it was October, when rain is almost constant, at least north of San Francisco. I was so grateful to have the shelter of my car and a budget that stretched to adorable small inns when it was too wet to camp. I only wrote very short posts on my US 101 road trip. Like this one and this one. I still remember the thunderous sound of a giant redwood falling in the forest in the middle of the night. I thought it was an explosion until somebody cleared up the mystery for me the next day. Visit the Pacific Coast Highway for supreme ocean views, wonderful hikes, and giant trees. Travel next to San Francisco or head inland to Yosemite. We’ve cycled in hundreds of cities across the globe but there’s no cycling city quite as fantastic as Vancouver in the summer. 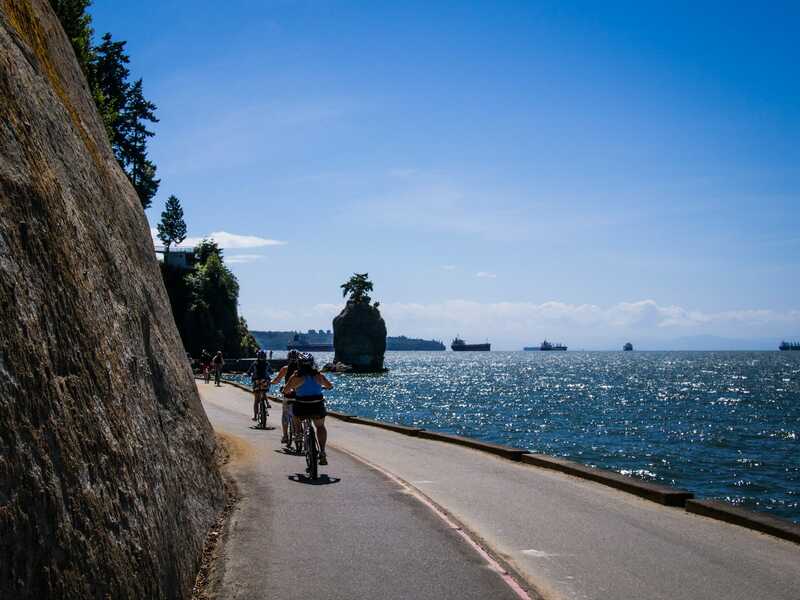 The classic Stanley Park route is a must-do, as is a cycle trip to Wreck Beach (Stephen’s fav beach in the world)!. If you’re heading out west, plan to get out on two wheels. Cycling in Vancouver is one of those travel experiences we hope to enjoy again and again. Yes, the Stanley Park Seawall Bike Route is really that beautiful. Grab our cycling guide to our three favourite bike routes in Vancouver. We still remember the pure joy of cycling home from Stanley Park in the dark after seeing a concert there. Visit Vancouver for our 17 favourite travel experiences in Vancouver. Travel next to fabulous Vancouver Island, of course! Or take a trip to Whistler. 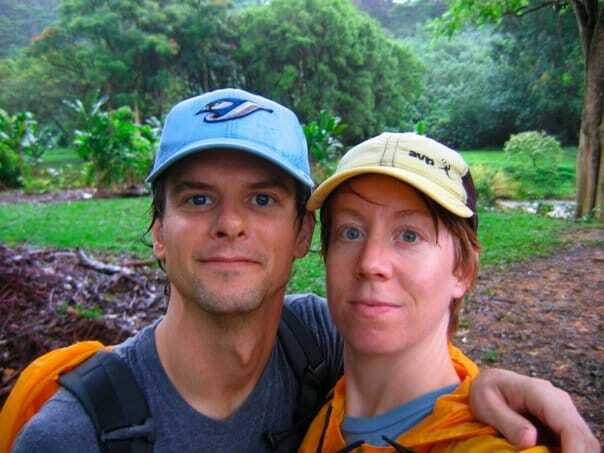 After 20 years of travel we’ve learned so much about the world and about ourselves. But the biggest lesson we learned is that, when you travel, there’s always something new to learn. We hope this post has inspired you to try some of the travel experiences we’ve enjoyed or to go out and make your own adventures! PIN for your bucket list! Gosh! You guys have covered almost every place on my bucket list. My favourite travel experience has to be the last road-trip with my dad and uncle probably 20-25 years ago (I was a kid). We did the whole North Eastern belt in India, covering all the seven sister states and all it took was 3 weeks. Camping, sleeping under the stars, hunt for food, etc was all too exciting and got me hooked to traveling forever! Oh wow, that sounds awesome! I can’t even imagine what travelling there was like that long ago. 20 years sounds so great. Well done guys. :) Loved reading your experiences and truly agree that travel is not about a place rather it’s about a feeling and experiences whether it’s good or bad. The best reads were the Indian Bus Bumpy Ride, The Norway fishing, Sri Lanka experience and absolutely loved the cycling route in Vancouver. Gorgeous! Thanks so much Rahul! Glad you enjoyed reading about our adventures – I often feel as though I can only capture a small slice of the story but as long as it’s enough to inspire other people to get out there and see the world then I am happy. It was really hard to get past those cute and cuddly little pandas! They are the one animal my daughters are telling me they want to see and I have to admit I want to see them too. I have never heard of water that glows so that would be my next adventure. It would have been an amazing but slightly crazy experience! One I am now adding to the bucket list. Thank you! You’re welcome. I think your daughters would LOVE the panda bears. I know I turned into an 8-year-old girls as soon as we saw our first one. They are just so cuddly. 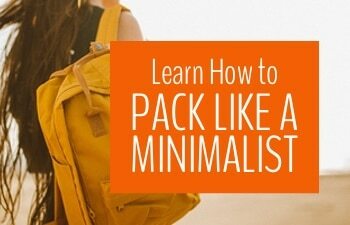 Your style of traveling is something which I would want to implement in my life too. I am a traveller but the way you travel is really an inspiration. Loved loved reading this post. Awwww, thanks so much. I think travelling by bike really opened our eyes to the possibilities for a different kind of travel. And now, when we get to join in with yoga communities around the world that helps us have a more local experience too. My suggestion would be to start by contacting groups / people that have the same interests as you at your destination and see if they want to meet for coffee or to do your shared activity. Or just to see what they recommend doing in their home town! Such an amazing post – thank you for sharing all this information and these adventures! I really hope I get to write such a post one day, too. I am super jealous of the panda adventure and sleeping under the stars in Jordan sounds hella amazing, too! Thumbs up for all those amazing adventures! I hope you do too! It’s kind of amazing to us how fast 20 years has gone… so before you know it you may be sitting down to write a similar post, remembering way back when you read this one :). Thanks for sharing that Marion. It looks amazing! The reason we don’t have any Australia experiences is that we’ve never been to Australia! It’s always seemed a little to far to fit into our plans and a little too vast. We feel like we’d need a year at least to properly explore. We will get there, but maybe not for a while yet. I think you are absolutely right that the best travel memories are often specific experiences and moments, rather than simply about mental snapshots of a given destination. My husband and I have been travelling together for 25 years, so perhaps its time we put together our list of favourite moments too! Lovely idea! Yes, definitely time for a list of highlights!! I’m looking forward to comparing notes. Thanks for sharing your Antarctica memories. If someone offered me a free trip anywhere in the world, I would pick Antarctica without a moment’s thought. It’s just so spectacular and I have ALWAYS been fascinated by penguins! 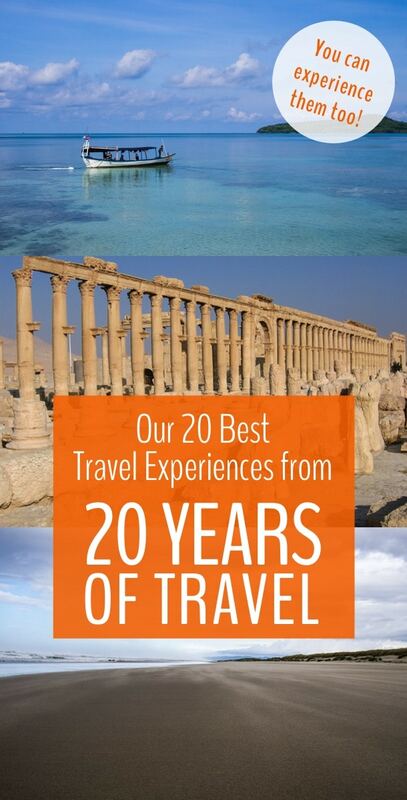 That is one impressive rich and varied list of travel experiences! It must have been really tough to select the best. I’m sure you had quite a few more on the shortlist Doesn’t it get tough to get satisfied with new destinations when you’ve been there, done it all.. It was so hard and I keep remembering other ones I wish I’d included! We spent a few hours tripping down memory lane for this one! We do sometimes suffer from the comparison bug… “Oh, this beach is pretty but not nearly as pretty as x beach!” We are very aware when we’re falling into that trap though and usually it has some underlying cause, like we’ve been travelling too quickly or we’re burned out on work or haven’t been practicing enough yoga! 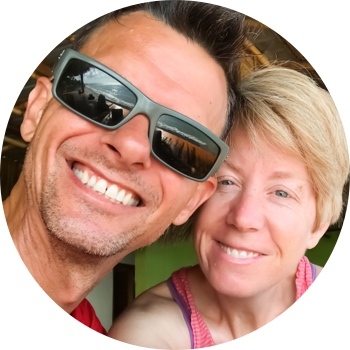 So, yeah, we’re not as wide-eyed as we once were but in so many ways we’re so much better equipped to enjoy and learn about new cultures that I think we’re definitely enjoying travel now more than ever. The bonus is, we now have an outlet to share it with lots of people, which helps us try to see places with beginner’s eyes! Ah these are so cool!! Especially love the pandas. But getting locked inside Pompeii is an amazing story too haha! Thanks Liliane! I don’t recommend getting locked into Pompeii but the site is incredibly inspiring! Thanks Marvi. It’s really quite a milestone! Five years is great too, though we found that year 5 of marriage is the hardest one for a lot of people – so stay strong ;). We also started slowly, doing a few months here and a few months there and then living and working abroad. 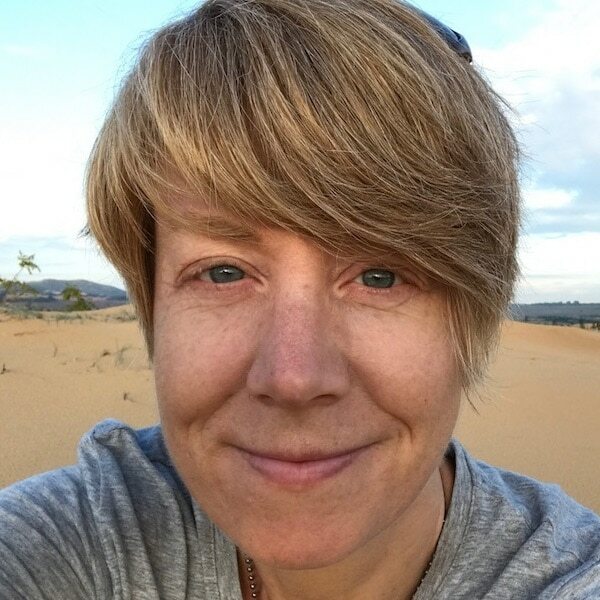 If you’re itching to go travel but can’t afford it, I highly recommend trying to find jobs in foreign countries – we survived as temps in London for a couple of years before we go hired on to “real” jobs and it was an amazing time! Our best travel experiences are always related with wildlife. The best encounters we had in South Africa, Kruger National Park and Kgalagadi Transfrontier Park. I really want to go on safari in Africa. Actually, I’d love to take an extensive trip around Africa. Just haven’t had time to fit it in the schedule yet!